Gregory Caputo, freelance drummer, specializing in "versatility within traditional drumming styles" (Modern Drummer Magazine) is a graduate of the Hartford Conservatory of Music Jazz and Pop program. Gregory is an inductee into the National Jazz Archives and a National Drum Association "Gene Krupa Search" international finalist. Tours include Phil Woods, Count Basie, Les Brown, Jimmy Dorsey, Tommy Dorsey, Benny Goodman, Artie Shaw and Harry James. Performances with Sammy Davis Jr., Cab Calloway, Sheila Jordan, Charlie Ventura, Barry Harris, Nneena Freelon, Grace Kelly Grover Mitchell and Benny Waters. Classic Drummer magazine describes Greg as "a master drummer who speaks volumes in refined sensibilities and superb technique." JazzTimes Magazine calls Greg a master of classic big band drumming. His CD release "Classic Swing with a Modern Drive is receiving ovations from the who's who in the jazz world. Gregory is a faculty member at the University of Massachusetts Jazz in July program and Mt. Holyoke College. 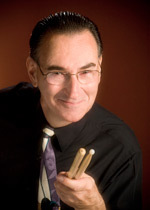 Mr.Caputo is available for jazz history lectures, drum clinics and guest artist appearances at educational and jazz venues.